Sofia is proceeding from the assumption that any de-facto revival of the South Stream pipeline would make it a pivotal player in the New Cold War, and contrary to most people’s initial reactions, Moscow might actually be interested. Bulgarian President Rumen Radev told Russia’s famous business publication Kommersant that his country wants to receive direct energy shipments from Russia through an undersea pipeline that he tentatively called “Bulgarian Stream” and which bears no difference whatsoever to the “South Stream” project that Sofia itself helped scuttle back in late 2014. 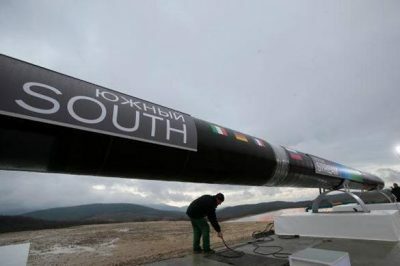 Since that time, Turkey and its Turkish Stream pipeline have replaced Bulgaria and the South Stream as Russia’s newest southern-focused energy corridor, but Sofia appears to be having second thoughts about the wisdom of obstructing Moscow’s megaproject in order to please its backers in Brussels and Washington at the time, hence the attempt to revive this project in everything but name. For reasons of national security amid deteriorating EU-Turkish ties that will likely remain on their downward trajectory for the foreseeable future, Bulgaria would rather receive direct energy exports from Russia through “Bulgarian Stream” than Turkish Stream, which if ever actualized would make it one of only three direct pipeline customers after Poland discontinues its purchase of Russian gas in 2022 like planned and Russia accordingly phases out if trans-Ukrainian pipelines. More costly but “politically convenient” US LNG is expected to make up the EU’s difference of supplies by that time, as well as the extra resources that Russia will export through Nord Stream II & Turkish Stream, both of which will directly connect to Germany & Turkey and make them important hubs for Northern/Western and Southern/Central Europe, respectively. Bulgaria, despite being a “small power”, wants to carve out an ultra-strategic niche for itself in Europe’s energy security by playing in the “big leagues” with these two Great Powers, betting on Brussels and Berlin’s dislike of Ankara to get them to be more lenient when it comes to enforcing EU regulations on any prospective pipeline deal between Sofia and Moscow (unlike the last time around with South Stream). Should this come to pass, then Bulgaria – and not Turkey – would become the ultimate “gatekeeper” for Russian energy supplies to the rest of the Balkans and Central Europe (Hungary), thereby enabling the EU to manage Turkey’s energy influence by restricting it to Southern Europe via the TANAP-TAP projects. In fact, even that might be “balanced” out if Brussels gets its way with the East Mediterranean Pipeline (EMP) from “Israel” to Italy that the author briefly touched upon in a January 2017 analysis about Cyprus and which political analyst Adam Garrie recently talked much more about in one of his latest pieces. When framed in this manner, the EU’s American-pressured policy of “energy diversification” takes on a new dimension by actually “encouraging” “Bulgarian Stream” so as to prevent any overreliance on Turkish-transiting supplies, especially in the event that a “New Détente” is reached. Altogether, the EU would in theory like to receive gas from Russia (Nord Stream II, “Bulgarian Stream”), Azerbaijan (via the Turkish-transiting TANAP-TAP projects), “Israel” (EMP), and the US (LNG), with the possibility existing for Qatari LNG to “fill in the gaps”. By being one of the EU’s two energy interfaces with multipolar Russia, Bulgaria hopes to be able to achieve an outsized geostrategic importance by leveraging this to its ultimate benefit in the New Cold War in order to finally become a “Balkan Power”, though not in the traditional sense of this concept. As the Warsaw-led “Three Seas Initiative’s” (TSI) southeastern-most member, Bulgaria could “balance” pro-American Poland’s institutional Russophobia in order to make this “bloc” mildly multipolar, especially when considering the TSI’s very close Silk Road relations with China. This would go well with Russia’s existing outreach efforts to the transnational organization’s four “Austro-Hungarian” states on which its Croatian rapprochement is predicated. Bulgaria wants to replace Serbia as the “object” of “East-West” rivalry between Russia on the one hand and the EU & the US on the other despite already being a member of the latter two’s main institutions (EU & NATO) by attracting attention to its newfound energy significance. Moreover, Bulgaria is a coastal state that already enjoys a lot of tourism from “both sides”, so that’s an additional “selling point” in its “international attractiveness”. What works against its envisioned geostrategic role, however, is that the West already has predominant influence over it and that this could be exploited at any time to provoke a bilateral crisis in Bulgaria’s relations with Russia so as to obstruct the shipment of its “Bulgarian Stream” supplies to the rest of its Balkan and Central European partners. There’s really no getting around this point, however, since Russia would either directly or indirectly rely on Bulgaria as a transit state in this respect, especially considering that the Republic of Macedonia is no longer a viable option after its rolling regime change succeeded in removing multipolar-friendly Prime Minister Grueveski and replaced him with the Soros-compliant Zaev. At the same time, though, Russia and Turkey might have had an implicit understanding with one another that the latter would be the main “gatekeeper” of Russian gas to the region and not Bulgaria, meaning that this “gentleman’s agreement” won’t be abrogated unless the EU made it all but impossible for this plan to go ahead, which is unlikely because Brussels nevertheless needs Ankara to supply Southern Europe via TANAP-TAP and can’t cut it out of the continent completely. At the end of the day, it’s difficult to say whether “Bulgarian Stream” will ever go ahead or not because its fate rests on two factors that evade the public eye, being firstly whether a Russian-Turkish implicit agreement on Moscow facilitating Ankara’s energy “gatekeeper” role in the region exists and secondly whether the EU would prefer for Southeastern Europe to “balance” its Turkish-transiting supplies through Russian-originating ones. Related to the second-mentioned point, the EU isn’t an entirely independent actor in this regard because it’s already proven its strategic weakness in going along with the US’ anti-Russian sanctions despite this being contradictory to its interests, though any developing Transatlantic rift over the Iran deal might provide a chance for increasing this project’s prospects. Because of these uncertainties, it’s impossible to say at this moment whether “Bulgarian Stream” will in fact ever be built, but at the same time and considering its strategic attractiveness to both the EU and Russia, it’s equally impossible to entirely discount it either. Featured image is from PravdaReport.